The ARIES team combines an innovative simulation platform and a domain-specific programming language to address the task of integrated social ecological systems. Our approach reconciles strong semantics with modelling practice to achieve advantages (such as modularity, flexibility, validation, and integration of multiple paradigms and spatio-temporal scales) that have largely remained unrealized in environmental modeling to this day. The software and programming language, developed by Prof. Ferdinando Villa, are fully open source. The modelling framework facilitates collaborative model development by using advanced web-based technologies like version control and cloud-based data sharing to accommodate the effective use of big data for environmental analysis. 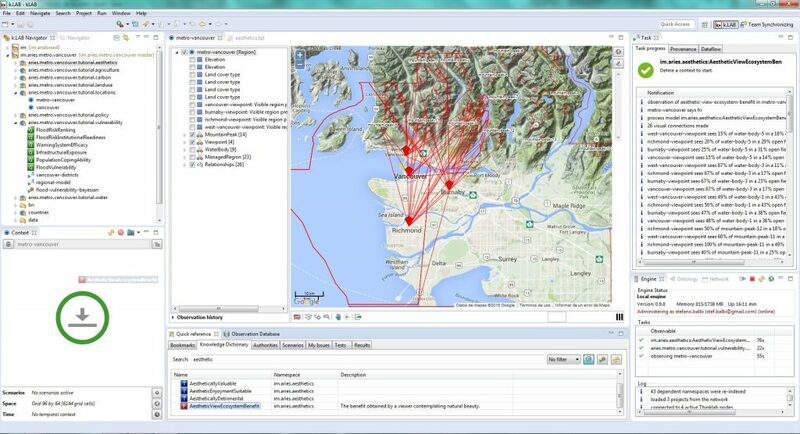 ARIES is powered by cutting-edge integrated modeling technology in development since 2007. The technology and corresponding k.LAB software are not specific to ecosystem services (i.e., they can be applied to other integrated modeling problems) and will be documented for developers and users at our future sister site dedicated to general integrated modeling. The innovations we introduced with k.LAB are fully operational, and we have been teaching their principles and use at ARIES training events since 2013. As a modeler, you can build on others’ work by connecting to the k.LAB network, providing automated access to a growing library of interoperable data and models shared by others. The semantics specified using the k.IM language ensures that the information available on the network has exactly the same meaning to the original developers as for you. You can use specialized, open-source software to access the network and develop new models, and you can install a k.LAB networked engine to deploy your models as services and make them available to others in your institution through the network. As an institution, you can maximize investment in reusable data and model components by installing a k.LAB network node, where you can publish research outputs in forms that make them available, with full access control, to partner organizations or the general public. All the knowledge you develop becomes part of a network where the best models and data will eventually be selected and rewarded by usage, just like web pages do on the Internet. As a researcher, you can develop models and annotate your data in the k.IM language, which integrates existing data and models and allows creation of new ones. The language completely describes each dataset or model’s semantics, allowing it to exist independently on a network node, and to be used and reused based solely on the meaning of its associated semantics. In other words, k.LAB enables new levels of modularity and interoperability between independently developed data and models, which has been a holy grail of the modeling community for decades. As a decision maker, you will soon be able to connect to modeling engines through the k.EXPLORER, an interface that enables a two-step modeling workflow (set a context and observe a concept). With minimal training, running many sophisticated models will become a simple matter of searching and observing a concept over a context – a user workflow that closely resembles the familiar ways we use the Internet today. Concept-based (or more technically, semantically driven) approaches have been discussed as a strategy to improve current modelling practices for decades. However, no approach has yet shown enough results to emerge as an accepted standard, making the k.LAB prototype a first real opportunity to reach this stage. 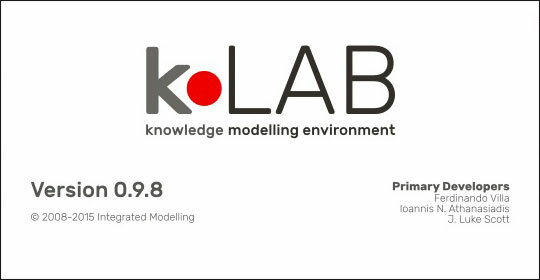 k.LAB’s integrated modelling paradigm is ideal for use on the “cloud,” and allows users to query the existing knowledge base and independently contribute data and models that can be shared and linked automatically for other users. This creates a potentially Wikipedia-like archive of community sourced models that grows in value to the scientific community with increasing use. Secure certificates enable us to permit access to certain network-available models to different user groups, allowing very easy access to scientific data and models. The provision of integrative data and models has applicability to numerous fields (e.g., evaluation of disease transmission, commercial modelling of customer behaviors, or financial analysis of the resilience of loan applicants in the face of economic shocks). The diverse uses of k.LAB have not been fully explored.